The underwater investigations of the "Grande America", , carried out by the Italian shipowner Grimaldi, were continuing off La Rochelle. The Norwegian offshore ship "Island Pride", equipped with ROV, returned to the location from Brest on April 9, to further examines the wreck in a depth of over 4,000 meters. The wreck was found resting upright on a sandy bottom and was buried several meters with its rear part. Aerial observations by a Falcon 50 of the French Navy and a Beechcraft 350 of the French Customs showeed some low intensity iridescence on the water surface above the wreck. These residues of oil and oil disappeared under the effect of the natural mixing of the sea and were not recoverable by the BSAA vessel "Argonaute" which was sent back to the port of Brest by the end of last week. Air assets continued to monitor the area, as well as the EMSA satellite system Cleanseanet, the European Maritime Safety Agency, to ensure that there were no significant oil spills from the wreck. 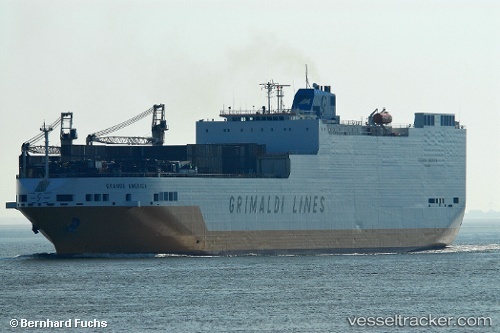 While the device in the sinking area of ​​the "Grande America" were significantly reduced, two of the ships engaged in clearance operations arrived this week in Brest, the "VN Partisan" and "VN Sapeur". During a dry dock stay, planned to last about ten days, their hulls which were in contact with the hydrocarbons released by the wreck will be cleaned. Grimaldi fianced the thorough cleaning and restoration of the ships and their equipment. While the contract also includes the cleaning of heavy equipment to fight against pollution, other ships will benefit from the same grooming, probably towards the end of the month. These are the "Argonaute" and the "Rhône" of the French Navy. The first was still mobilized in the Bay of Biscay around the sinking area, the second is now engaged on another mission. Regarding pollution, the last flights made this week showed a disappearance of the oil front and a lack of significant recovery from the wreckage. Above the wreck a non-permanent iridescence remained on the surface, which disappeared with the mixing of the sea.